While both species have black beaks and black legs, the spotting on the breast of the White-rumped Sandpiper is cleaner with no buffy tones. Baird's Sandpiper is significantly buffier in the fall season (as this specimen is which was taken in September). However, even in spring, the Baird's Sandpiper's spotting seems to bleed a slightly buffy wash on the upper breast. Status and Distribution for North-central Texas - White-rumped Sandpiper is a spring migrant only, usually in the highest concentrations around early May. They are generally not found at all in fall and would likely need photographic documentation if discovered during the fall season. Baird's Sandpiper can be found in either spring or fall. Neither bird is found in winter. Again, both species have black legs and beak. The upper breast of the White-rumped Sandpiper is spotted cleanly as this bird is. The upper breast of the Western Sandpiper is somewhat variable. Occasionally, spring Western Sandpipers will have either small, cleanly marked spotting or show an almost whitish upper breast. The bill structure on Western Sandpiper can frequently show a slight D-curve to the bill (not visible here) while White-rumped sandpipers usually show a straight bill. The Western Sandpiper is definitely smaller in length as shown here, but this is sometimes difficult to determine in the field if both birds are not present. Status and Distribution for North-central Texas - White-rumped Sandpiper is a spring migrant only, usually in the highest concentrations around early May. Western Sandpipers can be found in either spring or fall, but most records are from late summer and fall. 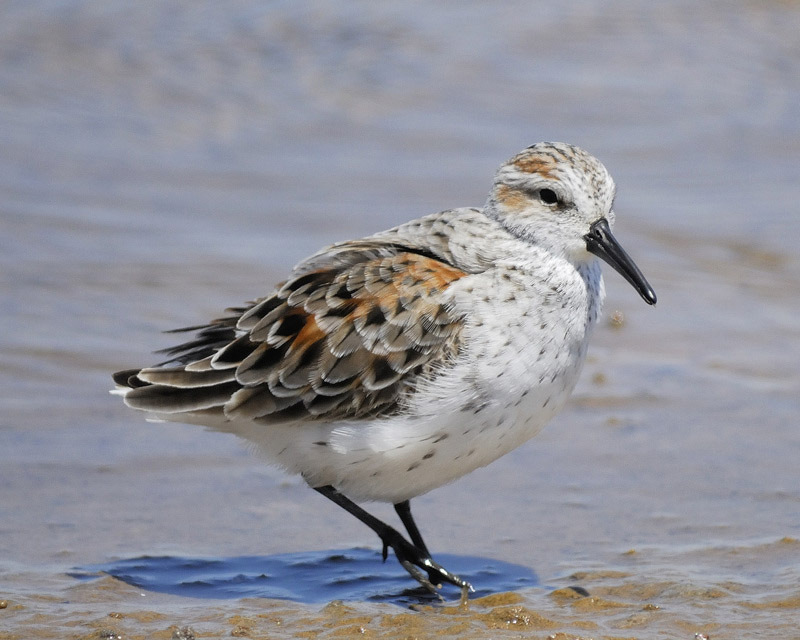 Neither bird is generally found in winter although there are winter records of Western Sandpiper in North-central Texas.